Featuring brand-new stories (and a few poems) by: Joyce Carol Oates, Jonathan Safran Foer, Robert Pinsky, Edmund White & Michael Carroll, Richard Burgin, Paul Muldoon, Sheila Kohler, C.K. Williams, Gerald Stern, Lou Manfredo, S.A. Solomon, Bradford Morrow, Jonathan Santlofer, Jeffrey Ford, S.J. Rozan, Barry N. Malzberg & Bill Pronzini, Hirsh Sawhney, and Robert Arellano. From the introduction by Joyce Carol Oates: New Jersey!--"The Garden State"--our fifth smallest state, with only Hawaii, Connecticut, Delaware, and Rhode Island below it in land mass, yet it's the state containing the "most murderous" American city (Camden) and the state generally conceded to be, square mile per square mile, the most densely politically corrupt. (Louisiana has been, by tradition, the most corrupt of all U.S. states, but in recent years Illinois has been closing the lead.) Atlantic City, Jersey City, Hackensack, Hoboken, Secaucus, Newark, Camden (three recent Camden mayors have been jailed for corruption)--in these cities as in others corruption isn't aberrant but rather a way of (political) life . . . Sitting between the great cities of New York and Philadelphia, New Jersey has been by tradition a heavily "organized" Mafia state, as it was at one time a northern outpost of the Ku Klux Klan, with a concentration of members in Trenton, Camden, Monmouth County, and South Jersey . . . In such ways, the most civilized and "decent" among us find that we are complicit with the most brutal murderers. 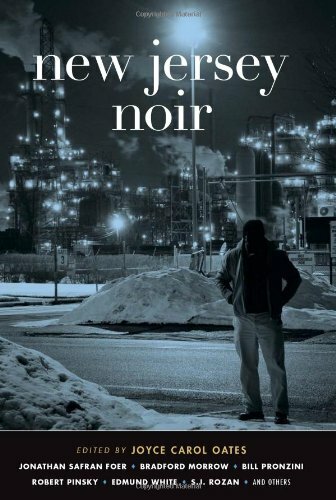 We enter into literally unspeakable alliances--of which we dare not speak except through the obliquities and indirections of fiction, poetry, and visual art of the sort gathered here in New Jersey Noir.